Thank you all for subscribing to our Newsletter! We plan to keep you informed of all the goings on at Blue Hen Quilt Shop, including new fabrics and notions, new classes, links to the Blue Hen Calendar of Events and Demo Days! Our Doors are finally opening on February 15th at 9:30 am! We will have a busy week with registration for door prizes to be drawn on Saturday, February 20th at our Grand Opening Celebration! Our hours will be Monday through Friday, 9:30 am to 6:00 pm, and open late on Wednesday nights until 9:00 pm, and open Saturday 9:30 am until 4:00 pm. We are located in Brookside Plaza Shopping Centyer at 73 Marrows Road, Newark, Delaware 19713. Out phone number is 302-533-5215. 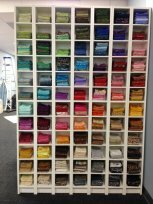 Come check out our Fat Quarter Wall, and we are busy cutting 2-1/2" strips so you can custom make your own jelly rolls! 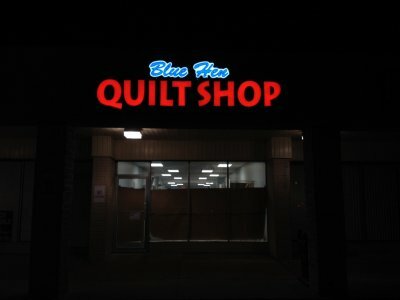 Check out the website at www.bluehenquiltshop.com where you can sign up for classes, see our Calendar of Events, and shop! Also, like us on Facebook! We have had a lot of fun showing our progress from an empty shell of a building to where we are today! Good night for now! Hope to see you all sometime next week!